As photopolymer plate formulators, manufacturers and suppliers, we often get asked about emerging technologies and their impact on flexographic printing plate development. Sustainability, printed electronics, 3D Printing are just a few “buzzwords” we hear a lot about, BUT…UV LED technology may be the most “emerged” technology that we come across today. We’d like to take a few minutes to discuss how we, from the plate development and supply side of the fence, see this technology playing out and where we see ourselves standing in this growing field. While the most common application of UV LED in flexographic printing today is often seen as the “on press” or print application area, the use of UV LED for curing flexographic plates has been around for longer than one may think. The use of UV LEDs has been most successfully applied via Esko in their “Inline” technology that combined plate ablation systems with UV LED curing technology - in this case, the plate could be ablated and cured on the same unit. 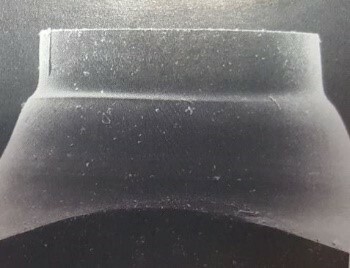 While the combination brought about an advancement in equipment consolidation, along with solid print performance that was sustained over a period of years, a separate back exposure step was still required and the additional curing step resulted in a productivity bottleneck in this technology. An additional application surfaced within the last few years, in which UV LED light sources were used in concert with standard fluorescent bulks to produce a “flat-top dot” printing plate without the need for tying up your imager…GAMER CHANGER! The UV LEDs main function, in this case, were to “outrun” oxygen during the curing step, allowing for the formation of a flat dot surface, while the fluorescent bulbs completed the bulk curing process in the printing plate. While it did isolate the curing step back to a separate exposure frame and away from the imager, a modified exposure unit was required, along with the need for multiple curing steps- thus, the productivity and expense of such a unit may not have been ideal for certain segments of the market. With productivity at the top of everyone’s minds these days, we knew this was not going to be the end game. The most recent addition to UV LED curing is a full LED-based, standalone exposure system. Several of these have been publicized within the past 2-3 years, with one system receiving dominant praise in the industry to date, drumroll please…the Esko XPS Crystal system. This system allows for simultaneous, UV-LED based curing on the back and front side of the printing plate, in a manner that is consistent in its application pass to pass, and plate to plate. This technology has also allowed for the introduction of a “platform” approach to platemaking automation, in which ablation to exposure, or further into plate processing - can be aligned together within a one, single production system…now that’s what we were waiting for. 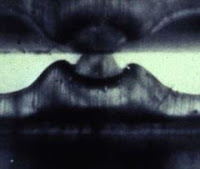 Photopolymers are not moody nor highly intelligent autonomous creatures. They are a mixture of chemicals designed with a class of behaviors and performance characteristics in mind, targeting a finished print application. Some could refer to them as high maintenance, as they require many other technologies to be successful- exposure, washout, on press components, etc. Any variation of these components can lead to variation in the application of said photopolymer materials, and this includes plate exposure technology. The more widely variable the exposure technology, the more variation one can expect from your photopolymer plate, seems logical enough. This is where UV LED technology holds a distinct advantage- an unparalleled uniformity of light intensity across the width of the exposure device, which translates into more uniformity of the finished printing plate itself. More uniformity means more consistency, and more consistency lends itself to more repeatable and predictable finished results. This, was the missing piece our industry was looking for all along. 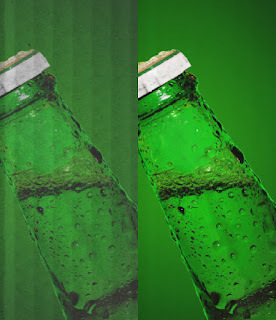 There are additional areas of benefit relative to how UV curing is applied to the printing plate. In addition to supplying consistent and predictable amounts of UV energy to the plate, applying this in a consistent manner is also important. The ability to cure each plate the same way- meaning no differences relative to temperature, energy or even the time between the front side and back side exposures- lead to greater and greater consistency. And with consistency, comes standardization and predictability…and ultimately, SUCCESS! UV LEDs are extremely powerful for their size, but it’s the size itself that brings the most flexibility into the platemaking arena. UV LEDs are most aptly integrated into smaller arrays that can be applied as a “light bar” for platemaking in which the bar itself, or the plate, moves under the irradiation source. This allows for a streamlined design, albeit one that is still highly, highly complex in its application despite the simplicity of the appearance. This streamlined approach has enabled several integrations of UV LED designs to date. One such integration is the “connection” of ablation to exposure, wherein the plate is automatically transferred from one unit to the other. Additionally, several examples of exposure to processor integrations have been implemented and currently can be found within the industry today, but have been limited to solvent processing only. The ultimate consolidation is the full combination: ablation - exposure - processing. How well can thermal or water wash systems integrate into this technology of the future? We’ll have to wait and see. 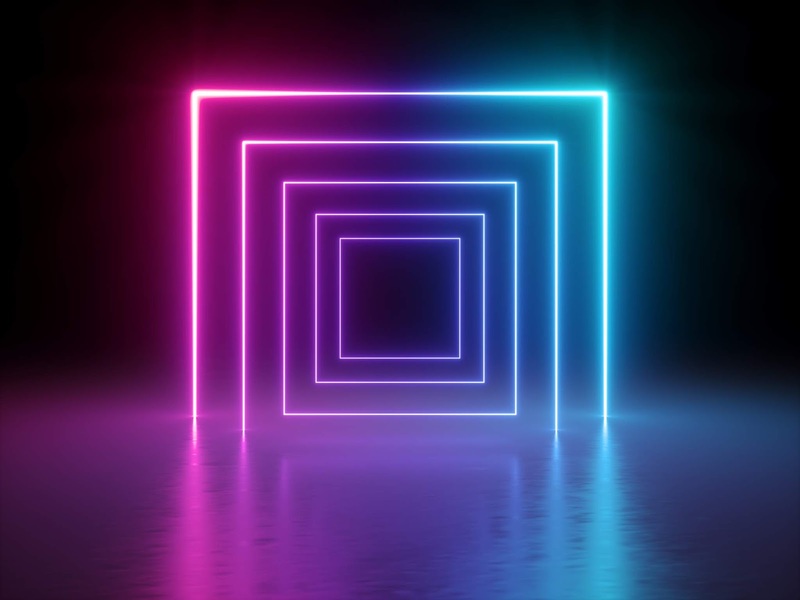 While the automation function is certainly a “future consideration” when evaluating UV LED technology, the other areas of consideration are related to productivity and environmental considerations. Productivity and sustainability - this won't be the last time you hear about this. For productivity purposes, we merely point to the expanding trends of “inherently flat top” formulations that have integrated into the market within the past few years, which was pioneered by, ahem…MacDermid. These formulations have changed the way we view formulation possibilities, and have increased the platemaking speed and efficiency as a result. 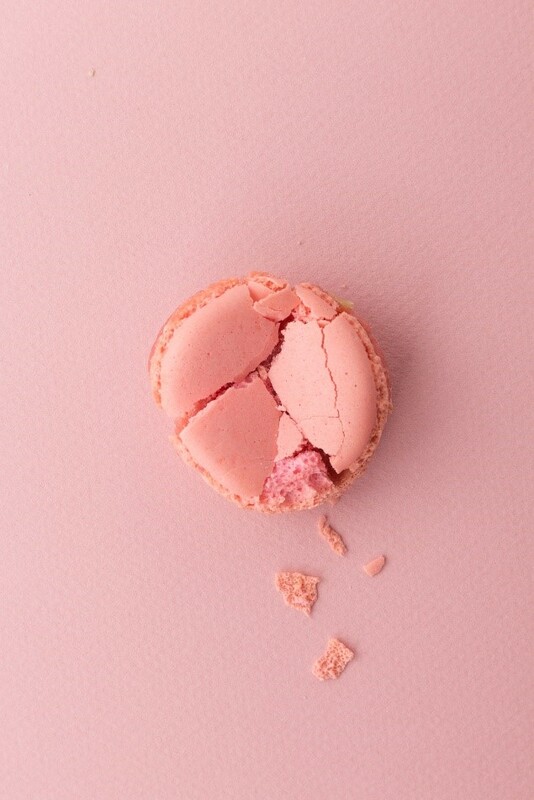 Therefore, our “new normal” has changed - speed is here, and UV LED can help to enhance the control of these types of formulations during platemaking even further. Additionally, a long-term consideration of UV LEDs when compared to existing fluorescent systems is the...c’mon you know the answer…environmental aspect and the elimination of mercury-based components. While not an active element in regulations today for flexographic platemaking systems, the regulations have slowly started to evolve in the areas of household lights, and the elimination of incandescent lighting within some regions. There will come a time in which mercury-based light sources may well be highly regulated or even banned in the future, and we as an industry must prepare for that eventuality. 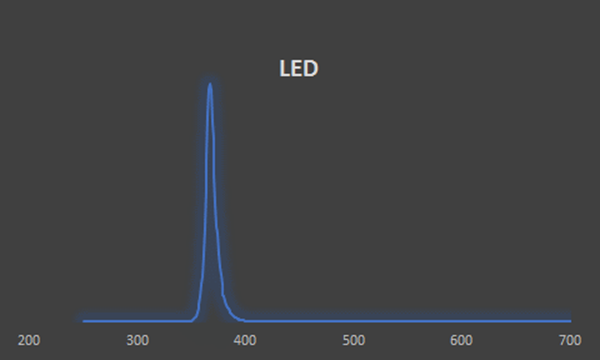 While the existing UV LED platemaking systems do target the same peak wavelength for curing (365 nm) UV LEDs are inherently near-monochromatic (See Figure 1), i.e. 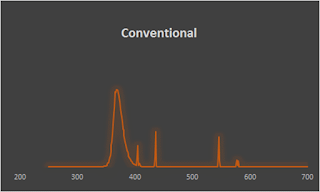 a very narrow wavelength distribution, when compared to fluorescent bulbs (See Figure 2). As a result, photopolymer formulations that were developed with broad band bulbs in mind can quite possibly behave differently, and unpredictably with these new systems despite their wavelength target similarities. To date, there are many formulations that have become “qualified” in these systems, so it’s safe to say we, as the plate developers, have had a bit of serendipity with respect to the interactions between plates and light sources. There are, however, things that we have learned about along the way that will help guide us on where to go next. 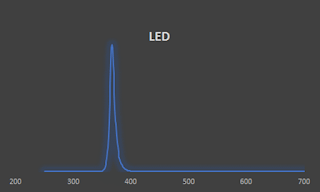 In addition to the monochromatic wavelength structure of UV LED systems, the other main difference in UV LED systems is the overall lamp intensity- i.e. it is WAY higher than typical bank light systems. As a result, the curing mechanism itself can radically change. This has been observed with two main defects on the finished printing plate: inconsistent or unpredictable dot gain, and dot cupping. While certainly addressable via optimization of process/curing conditions, the goal of new plate developments is to widen the platemaking window, allowing for a broader range of optimum conditions that aren’t impacted by slight changes in graphics, relief targets, print applications, etc…you know, the usual plethora of conditions the industry deals with. The outstanding uniformity of consistency of photopolymer plates derived from UV LED platemaking, and the print benefits obtained therefrom. The ability to automate platemaking. The increasing environmental pressures that will ultimately impact mercury-based light sources that are found in the existing bank light systems on the market today. Productivity and sustainability…last time - we promise! High quality formulations that exist TODAY, qualified and proven to work in UV LED systems. These include resins such as Digital RAVE and LUX ITP 60. 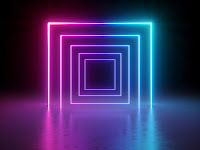 Newer technology platforms that are developed to be “tuned” to UV LED light sources, providing even greater productivity and wider performance latitude than plate technologies that currently exist. By combining our formulation expertise with outstanding collaborative partnerships, we can help propel this technology not only to full adoption, but to greater and greater capabilities for our industry and customer base. Improved quality, productivity and efficiency- areas that will drive more market share towards flexo and away from our competing technologies- while continuing to maximize profit along the way. To elevate your print to the next level with UV LED technology, contact MacDermid. 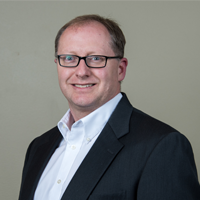 Ryan Vest, Global Director of Innovation, has been key in the development of industry-changing technologies such as LAVA® thermal plate processing and the LUX® Flat Top Dot technologies. He is widely known in the industry for his expertise in liquid photopolymer and corrugated plate technologies. Vest earned his Bachelor of Science in Chemistry from Berry College in 1995 and his Master of Science (M.S.) in Chemistry from North Carolina State University in 1998, joining MacDermid that very same year. Let’s face it printing on corrugated media has been plagued by fluting problems from the very beginning. What is fluting you ask? 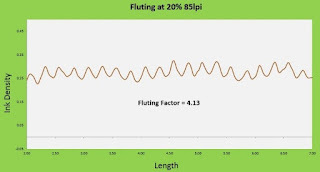 Fluting is an area of print having higher gain along the tops of the flutes versus in the valleys between them. This print density differential gives the appearance of the printed piece of corduroy striping running along the flutes of the board. For those visual learners (we love visual learners! ), the photo below shows heavy fluting on the left and minimal fluting on the right. For years, analog printing plates performed acceptably with minimal fluting; however, in the early 2000’s the print industry’s workflow started changing…enter DIGITAL PREPRESS. This workflow lead to an increase in the use of digital flexo printing plates. Unfortunately, digital printing plates tend to flute worse than their analog counterparts due to the geometry of the rounded printing plate dot and the edges of type and solids. This rounded surface and the contact angles with the uneven corrugated media contributed to the visual appearance of the printed flutes. As more companies embraced the digital workflow and use of digital printing plates increased, printing plate manufacturers and trade shops had to work closely to reduce the effects of fluting using this new digital process. 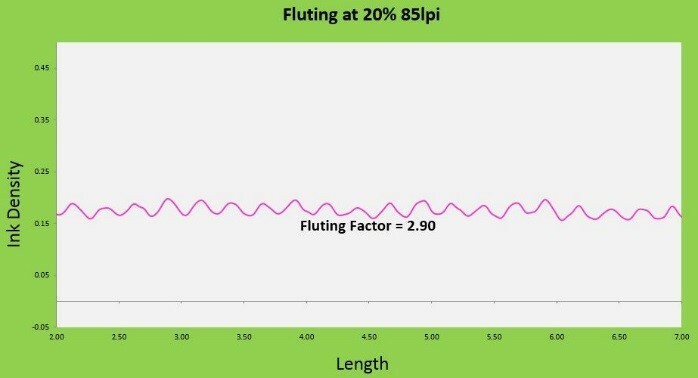 To better understand and measure the fluting effect, MacDermid Graphics Solutions created a device that could measure printed dot size across a wide portion of printed corrugated material. 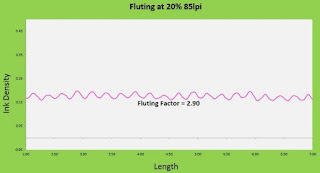 When these measured printed dot size readings are plotted, you can easily see the visual appearance of the printed flutes in a graphical chart. 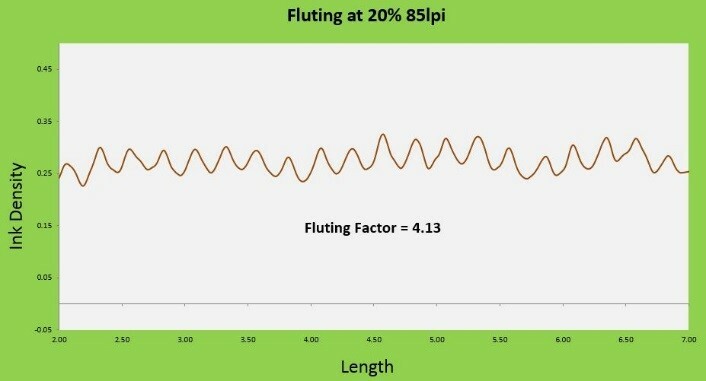 This use of a graphical measurement made it easy to identify and measure the difference between the average printed dot size from the top of the flute to the average printed dot size from the valley of the flute. The difference between these two numbers are what we called the Fluting Factor. The higher the number, the more noticeable the fluting is in a printed piece. If the number is small, it corresponds to a very smooth print appearance and lower visual fluting within the printed piece. 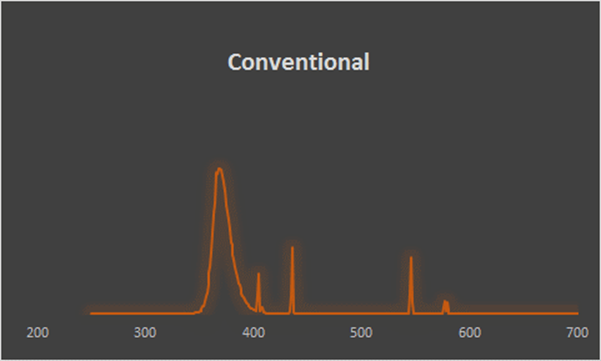 The following photos and corresponding Flute Factor readings will illustrate how this matches up with the visual appearance that is seen with the naked eye. Using the information from a Fluting Factor Study, MacDermid Graphics Solutions engineered a solution for digital plates to address the fluting issue in 2010 with the introduction of the LUX® process. The LUX process helped printers minimize the fluting effect by laminating a thin coversheet to the digitally ablated printing plate which, after exposure, produced flat printing surfaces. MacDermid then introduced the Digital MacDermid Anti Fluting (Digital MAF) plates in 2015. Digital MAF was the industry’s first digital corrugated plate that provided a flat top printing surface right out-of-the-box. The proven results gave platemakers a digital plate with a flat printing surface without the need for additional procedures, equipment, or consumables. With a 32 Shore A hardness, Digital MAF plates also offered a new dot shape optimized for even greater fluting reduction and dot gain performance against competing flat top technologies at the time. This engineered shoulder structure has an angle break in the sidewall of the print character which provided additional relief from the printing pressures to help lower the amount of impression provided to the printing dot. This pressure reduction helped decrease print gain and eliminate the distortions at the media interface while allowing for good surface contact to deliver excellent solid ink coverage. As the corrugated post print reproduction market continues to evolve, the industry is looking to save on raw materials without compromising quality. This created a trend to down-gauge corrugated boards and use paper grades with increasing amounts of recycled content. At the same time, the industry is seeing increased graphic requirements as the flexo market attempts to grow at the expense of Litho labels. Printers and brand owners demand and expect high quality printing regardless of the board quality. The conversion to higher recycled content and lower basis weight boards brings a new challenge to the corrugated printer…How do you retain smooth solid ink coverage, print crisp half tones and fine type while minimizing board crush? The higher recycled fiber content produces a different surface compared to the corresponding virgin liners of the same basis weight due to the additional processing steps needed to prepare the recycled content for reuse. Attaining good ink coverage on recycled board many times results in the need for additional printing impression to obtain smooth laydown which, many times, could lead to board crush. Board crush, if excessive, could lead to structural changes in the printed sheet affecting structural integrity of the folded box. This shift in business conditions highlighted a need for softer plates that offer high graphic reproduction abilities and the ability to minimize board crush using these evolving types of corrugated media while providing good solid ink coverage. Never satisfied, MacDermid Graphics Solutions answered this need by expanding our digital plate technology to include the new LUX® In-The-Plate™ (ITP) MELO. This plate is specifically engineered as a super soft, digital photopolymer sheet plate for use with post print corrugated board. With out-of-the-box flat-top plate technology and a 25 Shore A hardness, LUX ITP™ MELO produces printed results with excellent tonal reproduction and extremely smooth solid in coverage. LUX ITP MELO is the only commercial 25 durometer plate that offers out-of-the-box flat-top dot capabilities with outstanding imaging capabilities. This plate was designed to hold 1-2% dots at 133 line and consistently hold open the 95% shadow dots which eliminates the printer’s need to split out plates that have combinations of large solids and fine type or process color within a plate. This allows for additional savings in plating jobs and a reduction in the number of print decks used. With the unique engineered dot geometry introduced with the Digital MAF plate and now the LUX ITP MELO plate, printers are seeing excellent results printing high line process color using such a soft plate. The dot’s unique sidewall construction eliminates the typical bulge near the print surface that contributes to excessive print gain or doughnut dots and small type. 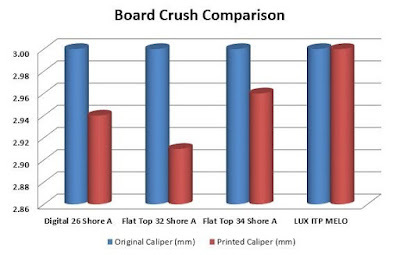 The softer 25 Shore A durometer has also demonstrated improvements in the amount of board crush measured after printing compared to the typical 32 Shore A printing plates, the industry standard for the corrugated market. While there has been a significant amount of work and research completed to improve digital plate technology, liquid photopolymer plates are still widely used in the corrugated market and continue to print extremely well with minimal fluting. To compliment the advancements of LUX ITP MELO, we added LTS, a new liquid photopolymer to our industry leading M System™ portfolio. LTS is a 25 Shore A hardness photopolymer featuring the same attributes as our flagship liquid photopolymer, LTL, a 32 Shore A hardness material. These two liquid corrugated photopolymers are designed to offer top protection from the conditions that are typically faced in a corrugated box house such as ambient UV Exposure, Heat & Humidity Resistance, and Ozone Exposure while in storage. While both deliver excellent ink transfer on all types of corrugated board, LTS offers the same benefits as LUX ITP MELO for use with lighter basis weight boards and those with higher content of recycled fibers. For those liquid manufacturers that have not moved into the digital platemaking process, we also introduced another new photopolymer, M Cap 45. This 45 Shore A durometer photopolymer was developed for use with the softer LTS or LTL photopolymer to provide the ultimate straight side-walled, flat topped printing plate for use with process color and fine type. M Cap 45 is cast as a thin layer of photopolymer against the photographic negative so that it becomes the printing surface and LTL or LTS is the softer base material forming the lower shoulders and floor of the printing plate. 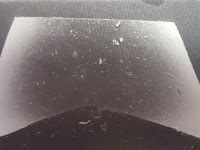 Capped liquid plates have always demonstrated the least amount of fluting of any photopolymer plate due to the flat top printing surface, nearly vertical shoulders, and the dual durometer construction of the printing plate. Any distortion from excessive impression caused by press setup or an uneven board surface is handled down the print wall, far away from the printing surface as demonstrated in the attached photos. With old challenges (fluting) and new challenges (board crush and high graphic requirements) the world of corrugated post print reproduction is continually changing. Using soft sheet or liquid photopolymer plates developed for these challenges is key to meeting the demands of brand owners. As the market moves to create savings using lighter basis weight boards with more recycled content and an increasing expectation of higher and higher print quality demands, flexo printers and plate manufacturers must continue to evolve to meet requirements in corrugated print. To elevate your corrugated post print reproduction to the next level, contact MacDermid. Email us today. Dan Fry, Portfolio Manager, Corrugated at MacDermid. Fry earned his Bachelor of Science in Chemistry from the University of Delaware in 1981 and joining Hercules Incorporated that same year. 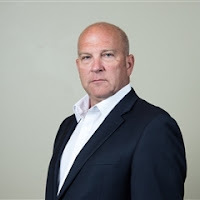 He moved to MacDermid with the sale of the Electronics and Printing Division in 1995 and has since served in various Technical and Sales Management roles since joining MacDermid. Flexographic (aka Flexo) printing quality rivals the quality of both offset and gravure. Is this the first time you heard this? Probably not! If you are reading this blog you are likely aware flexo is the #1 print method for flexible packaging in both the United States and Europe. The evolution of flexo from a somewhat viable option to the #1 choice is multifaceted with advancements across the entire printing process. One major factor is that flexo printers are optimizing their processes with flat-top dot photopolymer printing plate solutions. It’s been said, to do a job correctly, first you must have the right tools. In today’s flexo printing market, having the right plate (the tool) can make the job easier, more consistent, and ultimately more profitable. The packaging market consists of four major market segments: flexible, tag & label, folding carton, and corrugated. MacDermid Graphics Solutions (MGS) has an out of the box, flat-top dot solution for all markets called LUX® In-The-Plate™ (ITP). Why use a flat-top dot plate? Flat-top dots offer increased impression latitude, print consistency, and faster press start-ups. In addition, with MGS’s LUX ITP technology, you get near 1:1 imaging with an optimized dot structure for better wear characteristics. What does that mean for you? With the bump curve greatly minimized, that means you have now opened up your tonal range to print a wider range. This can give you cleaner vignettes, better highlight definition, or allow you to hit those “impossible” spot colors with process color inks. Since launching LUX ITP™ in 2016, MGS customers tell us these plates “even-out” the skill level of their press operators. In other words, they don’t have to worry about having only their best operators run critical jobs that would normally require a very light impression set. MacDermid measures Shore A using the ASTM standard by measuring the photopolymer stacked to 0.250” thickness without a polyester backing, giving us the polymer’s true Shore A number. We can also measure the effective plate durometer using the same instrument, providing a relative measurement of the plate durometer at the specific gauge at which it will be printed. For example, our LUX ITP 60 plate, a 60 Shore A at a 0.250” stack, measures 68 durometer on an 0.067” plate. The durometer is an important number to know when choosing your plate, and is a factor to consider for each market segment. Tag & label and folding carton printers have traditionally used medium durometer plates. This requirement was partially driven by the need to wrap a plate around a very small cylinder. THE IMPORTANT PART… the plate needs to wrap AND stay in place for an extended period. Certainly, the mounting tape plays a part in keeping the plate down on the cylinder, but more on tape later. Printing plates for this market print clean, high-quality graphics for long periods of time. MacDermid engineered LUX ITP M with these requirements in mind. LUX ITP M features very low tack which makes dust and debris, present in some paper stocks, no longer a factor. The durometer of LUX ITP M is a little firmer than most medium durometer plates so it can be optimized for wide web applications as well, but it retains the high flexibility required for the smaller print cylinders. It’s important to understand that the durometer of the plate shifts as the plate gets thinner because there is less material and more influence from the polyester backing. The effective durometer is also influenced by what is under the plate when it is mounted...the mounting tape. It is important to work with your plate and tape supplier to fully understand the plate/tape relationship specific to YOUR printing environment. Knowing what we know about plate gauge and substrates, it’s obvious why optimizing the entire plate/tape package is an essential part of making sure you have the right tools for the job. One such property – DUROMETER – is an important element to consider during the optimization process. What did you learn? Choosing the right plate for your printing process is important for your solid ink density, ink coverage, and dot reproduction. A super hard plate has low dot gain making it ideal for your highlight dots, but poor for your solids. In contrast, a super soft plate is great for your solid ink coverage but poor for your highlights, which will result in high dot gain because of the compressibility of the photopolymer dot. As a printer, you must determine what aspect of your printed work is most important to you. Do you print mainly solids and line work, where a softer plate would be beneficial, or do you print high-end process color graphics that would benefit from low dot gain? In today’s flexographic market, starting with the right plate can make the job easier, more consistent, and ultimately more profitable. 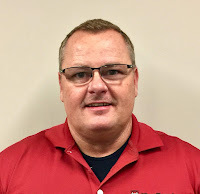 Ronnie Scogin is an applications development specialist with MacDermid Graphics Solutions. Ronnie has more than 30 years of experience relating to flexible packaging, with the last 13 years spent at MacDermid. 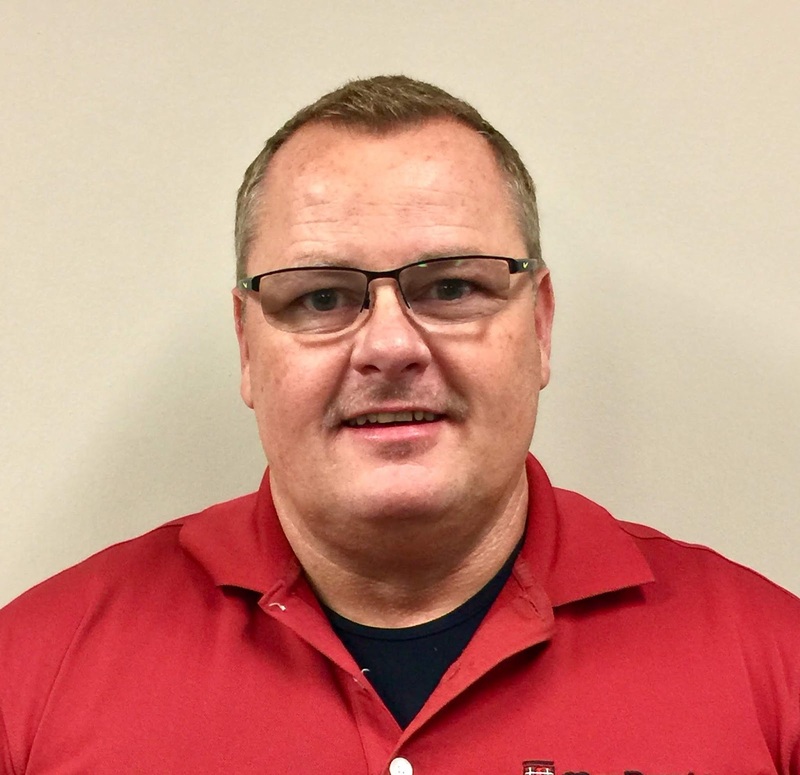 Ronnie’s expertise includes proper plate selection and optimization, pressroom auditing and best practices, and plate and print defect troubleshooting. Prior to 2016, Ronnie was a valuable member of MacDermid’s Technical Applications group, working directly with customers in the field across all flexo markets.